Will Smith at the premiere of Netflix's "Bright." 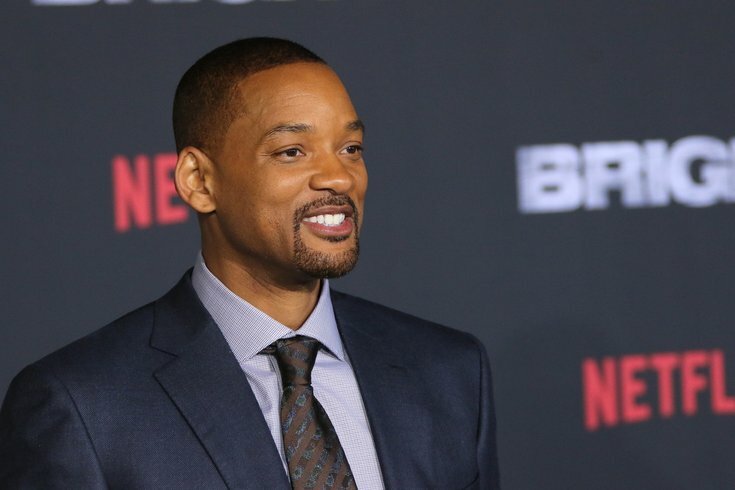 In just about four months, Guy Ritchie's live-action remake of Disney's classic 1993 film "Aladdin" will premiere starring West Philly's Will Smith as the iconic Genie. The early reaction to photos of Smith dressed as Genie was less than enthusiastic. His appearance with co-stars Mena Massoud and Naomi Scott on Entertainment Weekly was met with disappointment primarily because Smith wasn't blue like Robin Williams' original Genie. Smith jumped to the movie's defense to point out that he would, in fact, be blue throughout the film — but of course, you have to see it to believe it. A new series of photographs should put to rest at least some of the skepticism about the film. First released by the Instagram account @la_stregatta_luna, the promo art below appears to be from a mug that Disney will release as merchandise for the movie. Just how much "Aladdin" will blend live-action and advanced animation sequences isn't yet clear, but for the purists out there, Smith apparently will at least be blue and bear some obvious resemblance to the original character. The film will hit U.S. theaters on May 24.